The San Francisco Giants will play in the World Series with a stupid, self-inflicted handicap. 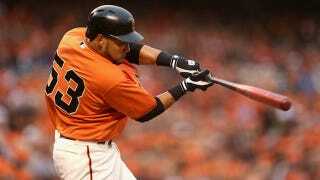 They will be without Melky Cabrera, their best regular-season hitter. Cabrera, whose 50-game performance-enhancing-drug suspension just ended, was left off the Giants' postseason roster for the dumbest of reasons. "We have decided not to send Melky on a rehab assignment because we do not intend to add him to any playoff roster," Bochy said. "We had to make this decision early because Melky would have to start rehabbing in Arizona. We have decided to develop our roster from our current group of players. They've done a terrific job during the critical part of the season. We have informed Melky's agent and they understand. I just like the way this club has played down the stretch and moved on. So we're going to move forward without Melky. "I'm not saying that he's not somebody that when he's doing what he's doing that we could use," Lincecum said after a 7-3 win against Arizona. "I'm not saying we wouldn't appreciate the addition, but we've got something good right now. I'm not sure, but that would probably bring some controversy with it as well. Both statements ring hollow, and when you read them you can hear Bochy and Lincecum straining to come up with something logical. Logic, of course, doesn't apply here: the Giants' decision to shelve Cabrera was a public relations decision rather than a baseball decision. Avoiding controversy took precedence over maximizing the team's chances to win. Yes, the Giants have succeeded thus far with Gregor Blanco, Angel Pagan, and Hunter Pence patrolling the outfield. But Gregor Blanco is Gregor Blanco: he has a .680 career OPS. He hit a cool .182 in the NLCS. Recall: Cabrera hit .346/.390/.516 before his suspension. And it doesn't stop with Gregor Blanco. The Giants will have to start a designated hitter for three games in Detroit. Their options are rather grim. They could move Pablo Sandoval into that spot and slide Joaquin Arias or Ryan Theriot in at third base, or they could leave the lineup as is and turn to Xavier Nady or Aubrey Huff. They could also put Posey in at DH and have Hector Sanchez catch, but then Hector Sanchez is hitting. None of those situations is pleasant. Cabrera's presence would eliminate all of them. So, Giants fans, if you find yourself cursing Gregor Blanco as he grounds out weakly to third, just remember that your team did this to itself, all because its bosses feared what people might say.